Exercise and fitness are currently all the rage. People are learning to eat the right foods, find an exercise routine they can follow, live a healthy lifestyle. Some of us need a little guidance, and this is where Bruce W. Perry’s book, Fitness for Geeks comes in. 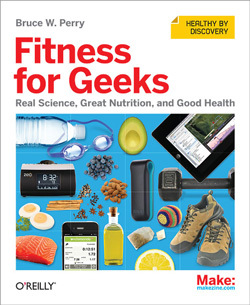 Fitness for Geeks is a well-researched book that takes a “geek” approach to fitness and health. This is not the type of book you zip right through; you need time to think about and digest (no pun intended) the extensive information Perry dishes out. Chapter 1: Fitness and the Human Codebase: Reboot Your Operating System sets the tone of the book by discussing how the human body’s software code needs to be tweaked and changed. He introduces concepts that are discussed at length throughout the book. Some are common sense, like the importance of sleep and de-stressing, while others are a little more controversial, like fasting and freezing swims. Perry shows us his “geek cred” in chapter 2: Fitness Apps and Tools. Most people who have just a passing association with the iOS store have noticed the plethora of exercise, weight loss, sleep monitoring, and workout tracker apps available. Fitness for Geeks adds even more variety of apps and web sites to help users with their fitness goals. However, some of those apps and web sites are a little intense for the average user. Unless I’m an athlete in training, do I really need to know my potassium to sodium ratio? In chapters 3-6 Perry delves deep into the science of how our body processes food, what and when to eat, and the chemistry of food. There’s an interesting discussion on macronutrients (proteins, carbs, and fats) and micronutrients (vitamins, minerals), along with web links for further information. Then Perry gets into the more debatable topics of food hacks and food timing. Perry is of the opinion that adults should only eat twice a day, for both the health benefits and cost savings. That theory goes totally against the recommendation of most health experts of eating frequent small meals throughout the day. He’s also a proponent of intermittent fasting, backing up his philosophy with interviews and studies. Again, this is more for the serious amongst us; please check with your doctor before trying any of these extreme suggestions. The remainder of Fitness for Geeks encompasses the physical part of fitness: being outside, navigating a gym or fitness facility, the importance of rest, sleep, and relaxation, supplements, and lifestyle hacks. Once again Perry recommends a multitude of apps and web sites to help track progress or learn more about a particular topic. Also included are descriptions of many typical gym and outdoor exercises, such as bench press, deadlifts, back squat, leg press, Tabata sprints, plank, and chin-ups, complete with photos. Pages in Fitness for Geeks are visually pleasing. Black text is used, with anything the author wants highlighted—headers, footnotes, web links, sidebar outlines—in red. Sidebars are scattered throughout each chapter and include recipes, conversations with doctors and noted nutrition experts, and extended details on a tidbit mentioned on the page. The images are all in black and white, which works for the most part, but the photos of people are drab and could stand to be a bit clearer. Overall, Fitness for Geeks is overkill for the person who just wants to get back in shape or start a fitness regimen. This book is not going to tell readers specifically what to eat or which exercises will work for each body type. It’s more a guide to help readers learn about different aspects of nutrition and fitness, with a lot of app-based learning thrown in for good measure. Much of the information is very scientific and not easily understood the first time through the book. A good deal will be met with skepticism; buying as little as possible at the supermarket and fasting come to mind. If you’re a serious athlete or want to know as much as you can about fitness and health, take a look at Fitness for Geeks. You can read a sample before you buy here.